Those relative few of us who remember Sophie Tucker at all can recall only a stout, corseted old lady in the black-and-white days of the Ed Sullivan TV variety show, waving a white scarf and claiming to be “The Last of the Red Hot Mamas.” We knew there must be more to the story, of course, beyond host Ed’s obvious enthusiasm and affection for her, along with those same feelings from the elder portion of his 1950s and early 60s live studio audience. But what? 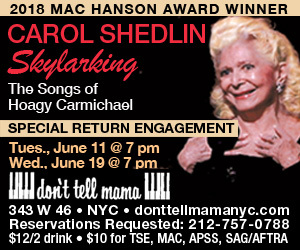 Now, thanks to Sharon McNight’s remarkable show at the Metropolitan Room, we get it, in a big way. Sophie Tucker cut a very wide swath through American show business in the first half of the twentieth century. Her first record producer was no less than Thomas Edison. He, along with composer-lyricist Shelton Brooks, started Tucker off on her trajectory with the 1911 hit “Some of These Days,” her lifelong signature song. (Brooks was said to be the first black writer of mainstream popular songs, and is even better known for “Darktown Strutters Ball” from 1917.) Sophie, who was born in Czarist Russia in 1877, but as a child fled the country with her parents to become “a nice Jewish girl from Hartford, Connecticut,” also worked in burlesque, was a Ziegfeld Girl, helped close the door on vaudeville, pioneered in radio, made a few movies, and was so ubiquitous in the mid-1930s that she became known as “The First Lady of Show Business.” She helped Ethel Waters introduce black jazz to white audiences. Tucker also influenced subsequent female performers, fat or not, from Betty Hutton to Bette Midler, who has kept a ribald character named “Soph” in her shows and has a daughter named Sophie. 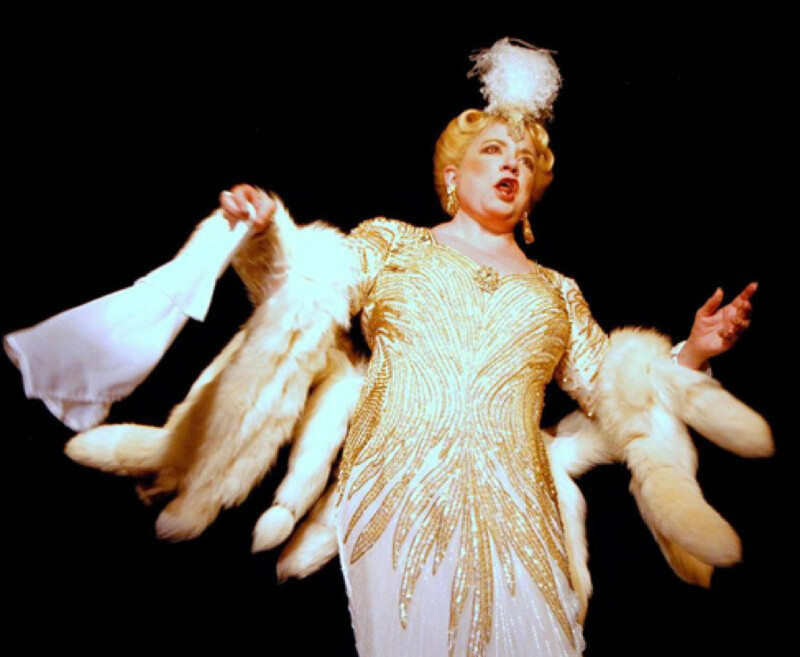 Sharon McNight literally embodies Tucker throughout this mythical stop on “The Sophie Tucker Farewell Tour” at the legendary New York City nightclub the Latin Quarter in 1965, just months before Tucker died. McNight remains in character throughout the act, from her introduction right through to her bows and curtain calls as Sophie Tucker. “Sophie” in turn introduces her accompanist as “Ted Shapiro,” who had been her performing partner since 1921. (The real-life pianist here is Ian Herman.) Many of Tucker’s songs are more familiar to modern audiences than she is, which we realize when we hear them: “It All Depends on You” (DeSylva, Brown & Henderson); “After You’ve Gone” (Henry Creamer, Turner Layton); “There’ll Be Some Changes Made” (Billy Higgins, W. Benton Overstreet); “You’ve Got to See Mamma Ev’ry Night (Or You Can’t See Mamma at All)” (Billy Rose, Con Conrad). Tucker/McNight even dips into the Great American Songbook with Cole Porter’s “Most Gentlemen Don’t Like Love (They Just Like to Kick it Around)” and the Gershwins’ “The Man I Love.” But Sophie’s songwriter of choice was Jack Yellen, best known as the lyricist of “Ain’t She Sweet?” and “Happy Days Are Here Again” (both with music by Milton Ager). For Tucker’s first movie, Honky Tonk, in 1928, Ager and Yellen wrote “I Don’t Want to Get Thin” and “I’m the Last of the Red Hot Mamas.” With other composers, Yellen contributed the autobiographical songs “I’m Living Alone and I Like It” (Dan Dougherty) and “My Yiddishe Mama” (Lew Pollack). The latter song, a sentimental ballad and international hit, was banned by Adolph Hitler in Nazi Germany. In between numbers, Sharon/Sophie inserts some standup snippets of biography: “We were so poor we couldn’t even pay attention.” The thrice-married Tucker complains “I can hold a crowd, but not a husband.” “I’ve got a million of ’em,” she assures. In her day, Tucker was considered risqué, but she prefers to characterize her humor and persona as “No shilly-shallying, just getting straight to the point—simplicity, not sophistication.” Tucker clearly knew herself and her audience well, and so does McNight. If you care anything at all about the history of American entertainment and seamless, comprehensive show-biz biography, I beg you not to miss them.